She’s favored to replace Hillary Clinton next year as secretary of state. Obama calls her “extraordinary.” She matches the current incumbent’s bullying, bluster and arrogance. Both deplore peace, nonviolence, and social justice. They’re pro-war, contemptuous of rule of law principles, and brazenly anti-democratic. They represent wrong over right. They’re war criminals multiple times over. They’re indifferent to human suffering. They disgrace America and humanity. If Obama nominates her as many expect, she’ll already “have undergone a blistering public vetting.” Perhaps so, but for lots of the wrong reasons. On November 30, Washington Post contributor Chris Cillizza asked, “Who had the worst week in Washington?” Susan Rice topped the list. Again for the wrong reasons. Her abrasiveness doesn’t help. She gives diplomacy a bad name. She’s an embarrassment to legitimate governance. She’s one of America’s worst ever envoys. She’s also one of Obama’s richest cabinet members. He father owned a British Columbia lumber company. He husband is a former television producer. In 2009, they’re net worth was estimated at between $23.5 and $43.5 million. Wealth, of course, disqualifies no one from public office. A previous article said she has major unexplained conflicts of interest. She and her husband own “at least $1.25 million worth of stock in four of Canada’s eight leading oil producers.” She has up to $600,000 equity in TransCanada Corp. It’s building the environmentally destructive Keystone XL pipeline. Her holdings also include up to $11.25 million in Royal Bank of Canada, as well as lesser equity in other Canadian financial institutions funding XL. She has lots of explaining to do. And not just about questionable financial interests. More on that below. From October 1997 to January 2001, she was Bill Clinton’s Assistant Secretary of State for African Affairs. She supported Washington’s imperial Afghan war. In February 2003, weeks before Iraq was attacked, she was asked about Colin Powell’s infamous UN WMD speech. After America destroyed Iraq, she urged long-term occupation. She wants no quick Afghan pullout. She endorsed imperial war on Libya. She falsified claims about Gaddafi forces committing mass rapes. She ignored killer gang atrocities. She’s silent about them now in Syria. She blames Assad for Western imperial crimes. She asked for UN authorization to wage war. She favors partnering with Israel against Iran. She wants one regional country after another ravaged and destroyed. She wants “no daylight” between US and Israeli policy. She endorses permanent imperial direct and proxy wars. She has blood on her hands to answer for. As UN envoy, she supports Washington’s war on humanity. As secretary of state, she’ll have more authority to wage it. She’s for everything honorable people condemn. She’s criminally unqualified for any public position. Washington Post contributor David Ignatius has close US intelligence ties. He openly favors America arming Western-recruited Free Syrian Army (FSA) death squads. He spent time with their leaders. They’re “solid,” he said. They’re experienced killers. They commit other atrocities. They express no regrets. Neither does Ignatius. On November 30, he rated Rice’s nomination “a close call.”He called Republican criticism “fabricated.” At the same time, he said she may not be Obama’s best choice. It’s “a close call on the merits.” It’s hard imagining what he has in mind. War criminals belong in prison, not government. Perhaps Ignatius and likeminded imperial supporters forgot. All he finds fault with Rice is that “some people don’t like her. They find her abrasive, self-promoting (and) mercurial.” He admits that State Department officials prefer John Kerry. He looks headed for Defense when Panetta steps down next year. It’s Obama’s call. In 2008, he chose a rogue’s gallery of cabinet and other top officials. Four deplorable years followed. Expect what’s ahead to be worse domestically and abroad. America already is a hair’s breadth from full-blown tyranny. It’s waging war on humanity at home and abroad. Rice and others like her favor continuing what should be condemned and stopped. New York Times contributor Andrew Rosenthal thinks Republicans took her “out of the running for secretary of state.” Others disagree. Critics hope so but still think she’s top choice. She’s an equal opportunity offender. She doesn’t care who she insults. Perhaps her chickens are coming home to roost. Moscow complained that with her at State, relations with Washington would be “more difficult.” They’re strained enough now. 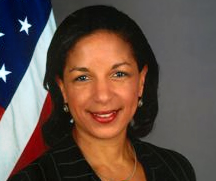 Compared to many reasons why Rice is a deplorable choice, “the flap over Libya is relatively minor.” She’s accused of misleading the public on events preceding ambassador Stevens’ death and three other Americans in Benghazi. Others say she goes out of her way to make enemies. Diplomats are supposed to show statesmanship, tact, discretion, prudence and thoughtfulness. Rice fails on all counts and more. Her position on major issues is hugely destructive. Her language is over the top. Calling Russian and Chinese Syrian resolution vetoes “disgusting” and “shameful” is no way to make friends. Rice excels at making enemies. Some ask what’s wrong with her? A better question is what’s right? Her Stanford and Oxford degrees don’t help. Her public service record matters most. It reflects complicity in major crimes. In 1993, she served on Clinton’s National Security Council. As explained above, she was his Assistant Secretary of State for African Affairs from October 1997 to January 2001. She was involved in proxy genocidal wars on Congo. Washington unleashed Ugandan and Rwandan forces. Eastern Congo was ravaged. It’s happening again. At stake are vast mineral resources. They’re largely untapped. They include oil, gold, diamonds, copper, uranium, cobalt, and tantalum. It’s a rare earth essential for manufacturing high-tech electronics. Nuclear power producers also need it. Rice has close ties to Rwanda’s US puppet leader Paul Kagame. Washington trained him at Fort Leavenworth, KS. She’s also connected to Uganda’s Yoweri Museveni. He recruits child soldiers. He trains them to kill. In 2001, the State Department named it a terrorist organization. Since 2008, it’s been called a Specially Designated Global Terrorist group. Washington uses Al Qaeda and various other groups as allies and enemies. Rice perhaps is perfect to front for no-holds-barred imperial ravaging. She’s uberhawkish, thuggish, and contemptuous of fundamental human rights. Obama favors her for the wrong reasons. It remains to be seen if she’ll become America’s top diplomat. With her at Foggy Bottom, “humanitarian” wars may destroy humanity on her watch.